Just got a trial N800 from WOM world yesterday.Spent a couple of hours fiddling with it but was not able to do much as both the connectivity options were not available. I don't have WiFi at my home and because of some technical problems from the operators side my GPRS is not working for the past 4 days :( . Its been quiet some time since I've got my hands on a device without S60 interface.This is my first hands-on with an Internet tablet. It was a surprise for my wife and dad that its not a phone because they think that if its Nokia then its got to be a phone. My dad is not at all "Mobilecentric" he calls my E61 a calculator and the N800 a transistor (old generation radios) :D.
N800 reminds me of the 7710 (S90) but this Maemo interface feels much zippier. At some point of time I've worked on Linux and thats why I kept searching for a command prompt thingi on the N800, but its not there. The media player is good, nice sound, the image viewer is nice with a fast zoom. Done most of what I can without any connection, but I've set it up with my gmail account. 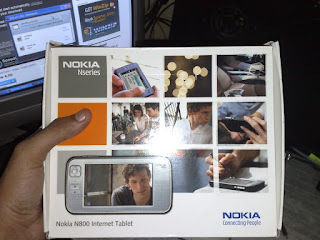 So today when I reach office I'll fire it up with WiFi and will be posting more of my N800 experience. Have fun with it. It's a great device. Indian leopards,mobile phones: Any connection? POLL : Which is your dream phone?